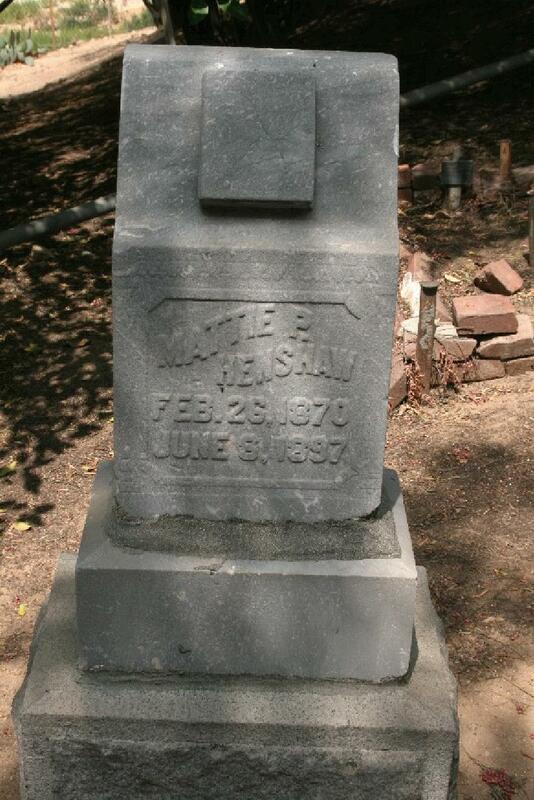 Mattie died Jun 8 18971,2,5,9 [18955,8], Los Angeles County, California1,2,5,9; buried Fairmount Cemetery, Azusa, Los Angeles County, California1,2,5,9. Mattie's death certificate shows the cause of death as meningitis, but family folklore is that she died from the shock of the house fire that nearly took the life of her infant son Russell.2 Not having anyone to care for baby Russell, Holmes took him to his parents who raised and educated him. Henshaw, Holmes, boarder, age 29, born Oct 1870 in West Virginia; father born in West Virginia; mother born in Virginia; widower; [..occupation unclear..]. Henshaw, Russell H., grandson, age 3, born Feb 1897 in California; father born in West Virginia, mother born in California. Henshaw, H., age 39, born in West Virginia; parents born in West Virginia; second marriage, married 6 years; occupation: sulfor see, Oil Co.
Henshaw, Pearl, head-of-household, age 37, born in Kentucky; father born in Indiana; mother born in Illinois; married 5 years; rented home. Henshaw, Russell, step-son, age 13, born in California; father born in West Virginia; mother born in California; attended school. Henshaw, Emily P., head-of-household, age 84, born in West Virginia; father born in Virginia; mother born in Pennsylvania; widow; owned home ($2000 value); no radio in home; occupation: none. Henshaw, Holmes H., son, age 59, born in West Virginia; parents born in West Virginia; married, first married at age 25; occupation: realtor, real estate; not a veteran. Henshaw, Annie, head-of-household, age 53, born in Ohio; father born in Ohio; mother born in Kentucky; married, first married at age 29; owned home ($7500 value); radio in home; occupation: writer, at home. He then married Lady Lou Williams16 [Lady Lou Robertson1], Jul 11 194816. 1900 census, 6th Judicial Township, Kern County, California; roll T623-87, ED 26, page 11B, line #78. 1910 census, 6th Township, Coalinga, Fresno County, California; roll T624-76, ED 59, page 151A, line #26. 1930 census, Goddard, Attica Township, Sedgwick County, Kansas; roll T626-719, ED 2, page 2A, line #11, dwelling #37, family #37. 1930 census, Laguna Beach, Orange County, California; roll T626-180, ED 47, page 11A, line #42, dwelling #361, family #361.